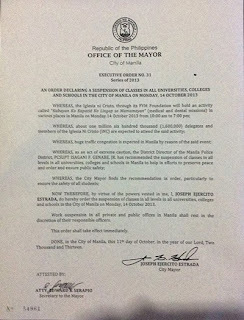 Class Suspension due to Typhoon "Labuyo"
No Classes in the City of Manila on 14 October 2013 due to Executive Order No. 31 by the Office of the Mayor declaring a suspension of classes in ALL Universities, Colleges, and Schools on Monday. The Iglesia ni Cristo (INC) through its FYM foundation will be holding the "Kabayan ko Kapatid Ko Lingap sa Mamamayan" Medical-Dental missions in various places in the City of Manila. 1,600,000 delegates and INC members are expected to attend and hence the need to suspend classes as per recommendation of the Manila Police District (MPD) to help preserve peace and order and ensure public safety. WHEREAS, as an act of extreme caution, the District Director of the Manila Police District, PCSUPT ISAGANI F. GENABE JR. has recommended the suspension of classes in all levels in all universities, colleges and schools in Manila to help in efforts to preserve peace and order and ensure public safety. 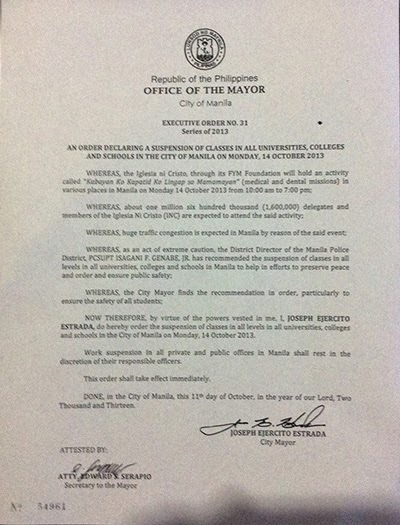 NOW THEREFORE by virtue of the powers vested in me,I, JOSEPH EJERCITO ESTRADA, do hereby order the suspension of classes in all levels in all universities, colleges and schools in the City of Manila on Monday, 14 October 2013. Work suspension in all private and public offices in Manila shall rest in the discretion of their responsible officers. DONE, in the City of Manila 11th Day of October, the year or our Lord, Two Thousand and Thirteen. Please visit Isko Moreno Facebook page for more details and latest updates. 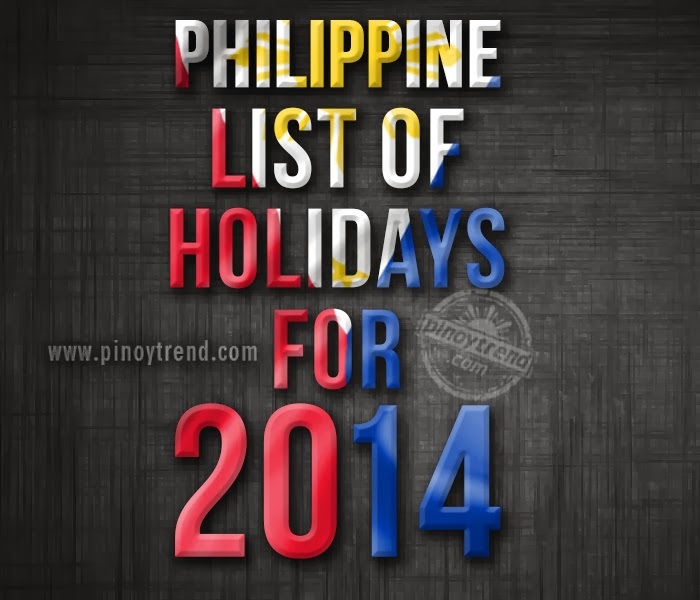 There are more than 2 more months remaining before the year ends but Malacañang has already declared the Philippine List of Holidays for 2014. 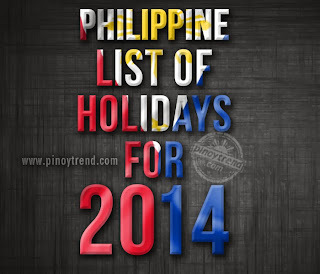 You may now start planning your 2014 vacations this early as we will be expecting about 4 long weekends next year as per stated in Proclamation No. 655 signed by President Benigno Aquino on September 25. First long weekend will be after January 31 (Friday) which has been declared as a special non-working holiday for the Chinese New Year. Next will be Maundy Thursday and Good Friday, April 17 and 18, which are regular holidays for the observance of the Holy Week. Christmas will fall on Thusrday next year which is a regular holiday will make December 26 a "dia pichido" and declared as a special non-working day making it another long weekend to watch for. Moreover, national holidays for the observance of Eid’l Fitr and Eidul Adha will be annoucned after their dates have been determined in accordance with the Islamic calendar. Class Suspension for September 23, 2013, Monday (as of 7:17 PM). Here's list of school, colleges and universities that have declared suspension of classes for Today, Monday, Sept. 23. This is due to many parts of Metro Manila and nearby areas are experiencing heavy rains. 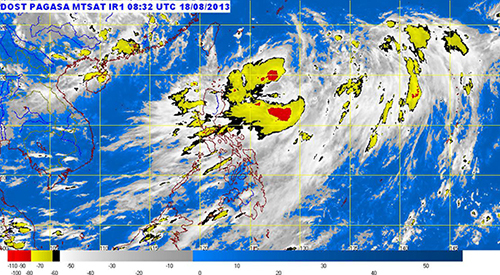 Southwest Monsoon affecting Luzon and Visayas. Meanwhile, at 4:00 a.m. today, Tropical Storm "MARING" (TRAMI) was estimated based on all available data at 600 km East of Itbayat, Batanes (20.5°N, 128.4°E) with maximum sustained winds of 95 kph near the center and gustiness of up to 120 kph. It is forecast to move North at 11 kph. The whole of Luzon and Western Visayas will experience monsoon rains which may trigger flashfloods and landslides. The rest of Visayas will have cloudy skies with light to moderate rainshowers and thunderstorms. Mindanao will be partly cloudy to cloudy with isolated rainshowers or thunderstorms. Moderate to strong winds blowing from the southwest will prevail throughout the archipelago and the coastal waters will be moderate to rough. Heavy to torrential rains is affecting Metro Manila, Rizal, Laguna, Bulacan, Zambales, Cavite, Bataan, Pampanga and Occidental Mindoro. Meanwhile, moderate to heavy rains is affecting Batangas, Laguna and Quezon and most likely to continue for the next 3hrs. Class Suspension for Today, August 20, 2013, Tuesday as of 6:55 a.m. 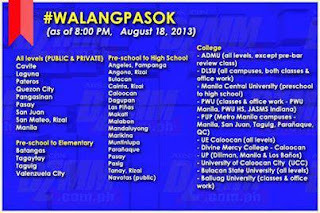 Here's the latest list of schools, colleges and universities that have declared suspension of classes and even areas of work for Monday, August 19, 2013. 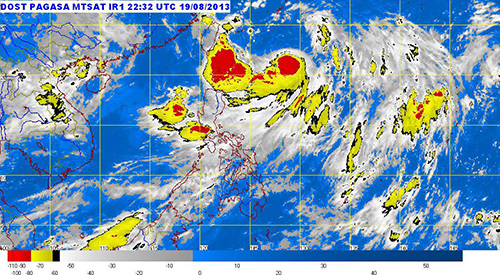 This is due to Southwest Monsoon affecting the whole country the Tropical Storm "MARING". 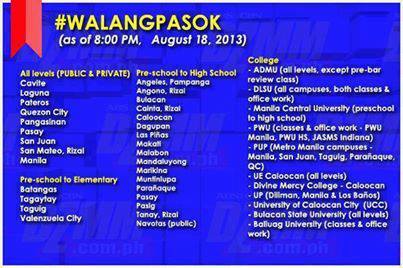 Here's the updated list schools, colleges and universities that have declared suspension of classes and even areas of work for tomorrow, August 19, 2013. This is due to Southwest Monsoon affecting the whole country the Tropical Storm "MARING". Southwest Monsoon affecting the whole country. Meanwhile, At 4:00 p.m. today, Tropical Storm "MARING" (TRAMI) was estimated based on all available data at 560 km East of Itbayat, Batanes (20.7°N, 127.9°E) with maximum sustained winds of 65 kph near the center and gustiness of up to 80 kph. It is forecast to move East Northeast at 7 kph. Metro Manila, Ilocos Region, CALABARZON and the provinces of Benguet, Zambales, Bataan and Occidental Mindoro will experience Monsoon Rains which may trigger flashfloods and landslides. Mindanao, Western Visayas and the rest of Luzon will have cloudy skies with light to moderate rainshowers and thunderstorms. The rest of Visayas will be partly cloudy to cloudy with isolated rainshowers or thunderstorms. 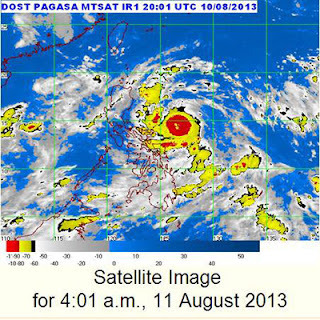 Visit www.dost.pagasa.gov.ph for more details and latest updates. Log on to www.globe.com.ph and click on \"Register\". Wait for the verification code which will be sent to your mobile number or e-mail address. You will be required to activate your account using this code in order to complete the registration process. Once registered, go to the homepage. From the \"I want\" dropdown menu, click \"to view my bills\". Wait for the bill verification code which will be sent to the enrolled mobile number or email address. Enter the verification code on the MyBill enrolment page to complete the enrolment. You may then view your bill online. You may go back to the add account option to enrol additional accounts. Click \"My Account\" on the upper right corner of the page. Click View after successful enrollment. 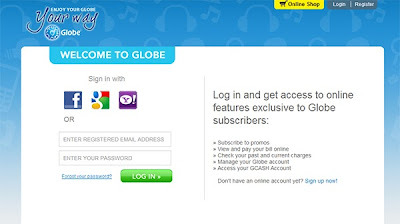 Visit www.globe.com.ph and Globe Telecom Facebook page for more details and latest updates. 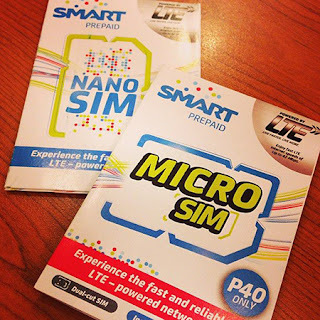 Smart launched the Philippines' 1st & only prepaid LTE service for LTE-capable handsets, making the fourth-generation (4G) service accessible to more people. The Smart Prepaid LTE SIM is available in two variants - the dual-cut micro SIM priced at P40.00 which includes 35 FREE SMS to any network; and the nano SIM priced at P100.00 which includes P50.00 load. Both can be loaded with Smart's LTE packages which offer unlimited LTE browsing for 1 day, 7 days or 30 days. Compatible for the following mobile phone: iPhone 5 and likes. Smart Prepaid LTE SIMs are now available at select Smart Stores and various telco tiangges in key cities nationwide. Existing Smart subscribers can also upgrade to LTE by purchasing the LTE SIM at Smart Stores, retaining their mobile number. 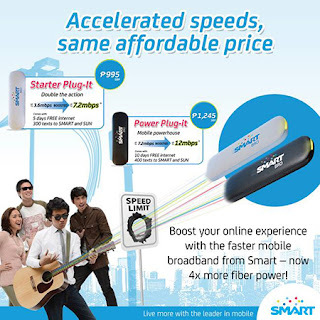 Visit www1.smart.com.ph and Smart Communications Facebook page for more details and latest updates. Amidst the inclement weather conditions due to Typhoon Labuyo (Utor), some cities in Metro Manila have already announced the suspension of classes at different levels. 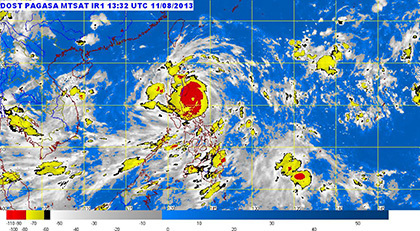 It has been anticipated as the typhoon started to affect huge part of Luzon with heavy rains. 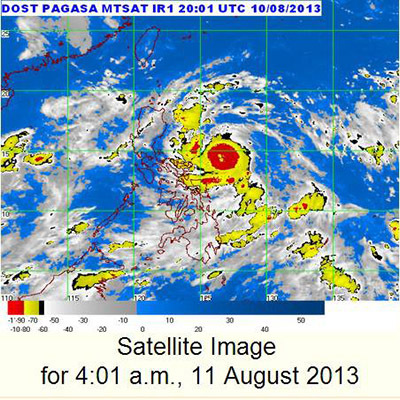 Storm signal were also hoisted to cities and provinces where Typhoon Labuyo is expected to landfall. August 12, 2013 Class Suspension due to Typhoon "Labuyo"
Cagayan Valley, the regions of Cordillera and Ilocos, Camarines Provinces, Rizal, Northern Quezon, Bulacan, Pampanga and Tarlac will experience stormy weather with rough to very rough seas. Metro Manila, the rest of CALABARZON and of Bicol Region, Zambales and Bataan will have rains with gusty winds with moderate to rough seas. The rest of the country will be cloudy with moderate to occasionally heavy rainshowers and thunderstorms which may trigger flashfloods and landslides. At 4:00 am today, Typhoon "LABUYO" was located at 375 km East of Daet, Camarines Norte (14.3°N, 126.7°E) with maximum sustained winds of 140 kph near the center and gustiness of up to 170 kph. It is forecast to move West Northwest at 19 kph. Catanduanes, Isabela, Ifugao, Nueva Vizcaya, Nueva Ecija, Aurora, Quirino, Polillo Island and Camarines Provinces will experience stormy weather with rough with very rough seas. Metro Manila, the regions of Ilocos and Cordillera, the rest of Cagayan Valley, of Central Luzon, of Calabarzon and of Bicol Region, and the provinces of Marinduque and Northern Samar will have rains with gusty winds with moderate to rough seas. The rest of the country will be cloudy with moderate to ocassionally heavy rainshowers and thunderstorms which may trigger flashfloods and landslides. Moderate to strong winds blowing from the Southwest will prevail over Palawan, Visayas and Mindanao and the coastal waters along these areas will be moderate to rough. Dr. Samuel Bernal and Dr. Vicky Belo, two famous personalities when it comes to Stem Cell Therapy, are featured speakers in the FIRST PHILIPPINE STEM CELL THERAPY SUMMIT to be held on August 19-20 at Crowne Plaza Galleria. Dr. Samuel Bernal is a world renown cancer specialist. He has been in the news recently, especially after treating Liezel Martinez of Stage 4 Cancer. Educated at Johns Hopkins’ and Harvard Medical School, Dr. Bernal is currently Professor Emeritus of Medicine at the University of California-Los Angeles, member of American Association of Clinical Oncologists, the American Association of Cancer Researchers and a recognized cancer investigator with the US National Institutes of Health. As a lawyer, his legal expertise includes cases on medical malpractice, medical product liability as well as Federal Drug Administration (FDA) and Federal Trade Commission’s (FTC) regulations in the testing, approval, advertising and marketing of health products. 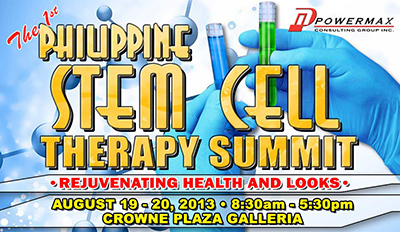 Dr. Bernal will talk about Global Trends in Stem Cell Therapy in the First Philippine Stem Cell Therapy Summit. Dr. Vicki Belo, more popularly known as the "Ambassadress of Beauty" or "Doctor to the Stars," is the medical director of the Belo Medical Group, which serves its patients through nine clinics - eight in Metro Manila and one in Cebu. She has pioneered liposuction in the country and has been doing her significant share of boosting Philippine medical tourism. With the help of her growing roster of celebrity talents, she has likewise propelled the Belo Medical Group to the forefront of cosmetic surgery. Dr. Belo will talk about Stem Cell Therapy Auto Grafting in the First Philippine Stem Cell Therapy Summit. This event will be beneficial for those people who are considering Stem Cell Therapy for the treatment of their cancer, diabetes, heart problems, neurological disorders, eye problems, rejuvenation or looks improvement. It will also help widen the knowledge of Doctors / General Practitioners and explain Stem Cell Therapy fully to their patients. Visit Powermax Consulting Group, Inc. Facebook page for more details and latest updates. 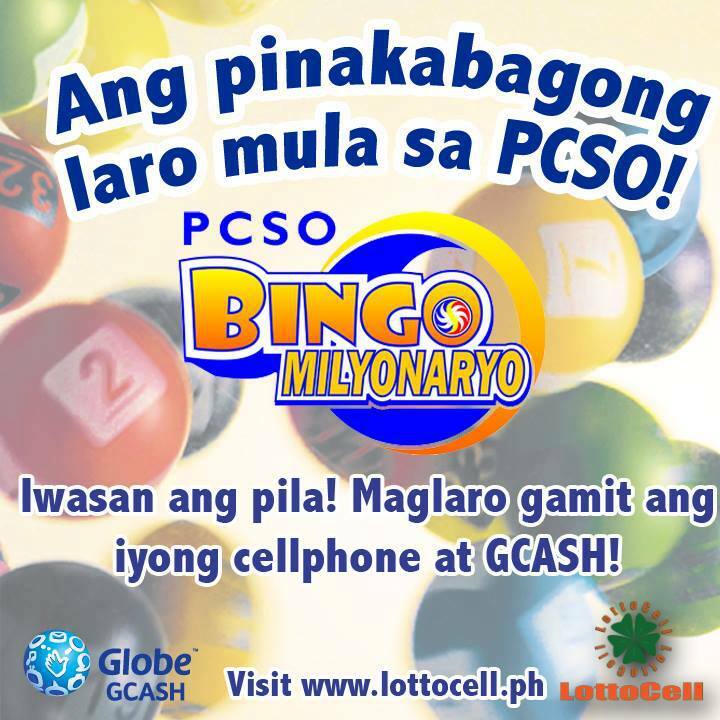 How to play PCSO Bingo Milyonaryo with Globe GCASH? Enter all the required information and Click "Register"
Transfer funds from your bank account online at www.globe.com.ph/gcash, via mobile banking with BPI (dial*119#) and Unionbank, via BancNet ATMs or through any of over 7,000 GCASH Outlets nationwide. Check your LottoCell wallet in the LottoCell mobile app to see if your balance has increased. Visit Globe Telecom Facebook page and www.lottocell.ph for more details and latest updates. Enjoy accelerated Smart Bro speeds at the same affordable price! Boost your online experience with the faster mobile broadband from Smart-now 4x more fiber power! Get the Smart Bro Starter Plug-it for a speed boost from 3.6 Mbps to 7.2 Mbps for the same price of P995; and the Smart Bro Power Plug-it from 7.2 mbps to 12 mbps for the same price of P1,245! Lenovo Group Limited has been popular for selling personal computers, tablet computers, workstations, servers, electronic storage devices and IT management software. Now they joined the so-called survival-of-the-fittest battle of best smartphones in the mobile market. Implementing an aggressive strategy, the company is paving it's way as they offer more of their Lenovo Smartphones. Lenovo Smartphones is gearing up to take on the smartphones territory with the likes of the rival companies. Lenovo Smartphones features multi-core processors, stellar battery life, dual-SIM support, good display technology and continuously expanding it's portfolio of Android-based devices that comes in affordable prices. *ALL PRICES may change without prior notice. Lenovo Smartphones Price List based from store list and some in web online prices. Lenovo Price List is for brand new phones and Philippine rate only.